They will be the leaders of our country, the creators of our national wealth who care for and protect our people. Welcome to the latest Policy Watch e-letter highlighting the latest news, research and policy developments relevant to NZCCSS’ core mission to work for a just and compassion society in Aotearoa New Zealand. Election 17 is nearly upon us and it’s looking like a nail biting finish regardless of where you sit on the political fence! At NZCCSS we are however heartened that both majority parties have publicly committed to lifting children out of poverty and there’s even a target to hold them to account: 100,000 children. While both leaders made their respective statements in the context of an election debate, it is critical policies are in place to achieve this commitment. Professor Johnathan Boston, who Co-Chaired the Expert Committee on Solutions to Child Poverty, and who has championed (along with others) a vision of New Zealand where child poverty is eradicated, is clearly rapped by this news, seeing these political commitments as historically significant. Equality Network – Which policies are most likely to make good progress toward a fair and more equal share of income & wealth? The Equality Network has released a scorecard with star ratings of income, housing, tax and other policies. Housing Scorecard – How will each party provide families the certainty of secure safe housing and good health, to reduce the number of poverty-related child hospital admissions? We investigated each party’s policies on health and housing and asked them this critical question. The Tick4Kids scorecards have rated political parties against 5 measures – family violence, health, housing, and income measures, and produced a simplified scorecard. People’s Agenda has separate scorecards for all different aspects including justice, gender equality and tax. Considers political parties against 5 measures:1)Empowering communities to reduce social harm and criminalisation 2) reduce targeted criminalisation of Maori, 3) Invest in community and 4) justice initiatives with promising results, Reduce the record prison population. On election day, Saturday 23 September, all voting places will be open from 9.00am to 7.00pm. Information about where and when to vote, and who you can vote for, will be available from Wednesday 30 August at elections.org.nz or by calling 0800 36 76 56. It will also be included in your EasyVote pack. You can vote at any voting place in the country, but you may need to fill in an extra form if you vote outside of your electorate. Demonstrating our value and the contribution we make to our communities will provide a positive foundation for future focused strategies. Speakers include: Shelley Mallett, the Brotherhood of St Lawrence and Garth Nowland-Forman from the LEaD Centre for Not-for-Profit Leadership. Understanding policy and process changes and likely impact of these on how we structure ourselves will be a major determinant of our future success. Speakers include: Dorothy Adams, Acting Chief Executive, the Social Investment Agency and Trevor Moeke, Principle Advisor Maori, The Treasury. Knowing the options and using these to plan how to maximise the opportunities in front of us will create the positive pathways forward. Speakers include: Paul Nixon, Director of Professional Practice, Ministry of Vulnerable Children Oranga Tamariki, Julian Moore, Director, Delivering Revenue Growth, Brian Smith, Harwood Institute for Public Innovation. Making Working for Families and Child Support Simpler: NZCCSS has submitted to Inland revenue on Making Tax Simpler: Better Administration of Social Policy. NZCCSS’ guiding position on the changes proposed is that already vulnerable families and whānau should not find themselves in further hardship. NZCCSS also recommended a Child Impact Assessment, based on the key principles of the United Nations Convention on the Rights of the Child, to identify the full impact of the proposed change on all on the children in a household. Read NZCCSS’ full submission here. Sanctions impact on children – The argument to adopt child impact assessments across all social policy is all the more critical after reading journalist Lisa Owen’s item on the impact of sanctions on sole parent support recipients, who don’t name the father. In brief, a Ministry of Social Development report states clearly there is no evidence to substantiate that”benefit reduction is achieving the policy’s intent”. What the report does substantiate however is that the child and mother bear the brunt of the sanction. A reduction of $22 dollars a week is significant if you are struggling to feed, clothes and house your kids never mind any needs a mother might have. If we truly want to be child-centred and, ethical role models, we need to strengthen the use of child impact assessments. And in another Ministry of Social Development story, 7148 people grandparented on Special Benefits after it was replaced by the Temporary Additional Support, in 2006, are still waiting a back-payment after an error was identified 2 years ago. At the crux of this issue is a misunderstanding around whether or not a client could cancel their special benefit, and apply for a TAS even if they were better off. Advice in 2015 confirmed clients could move to TAS. As a result over 7,000 client were due paybacks with many still awaiting this much needed payment. 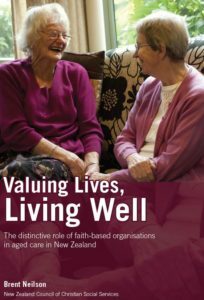 Leadership Opportunity at Presbyterian Support Otago! Chief Executive Officer, Presbyterian Support Otago: This vacancy arises following the planned retirement of the long serving and respected Chief Executive. Reporting to a professional Board, the new Chief Executive will build on the legacy of strategic, financial and operational success supported by dedicated employees and volunteers. Beyond the leadership, people management and growth focus required, the Chief Executive will retain strong relationships with stakeholders and play an advocacy role based on PSO’s understanding of community needs. Key objectives will be to enhance relationships, build new partnerships, further develop cultural competency and work force capability and to ensure business sustainability for mission impact. For more information go to this link. 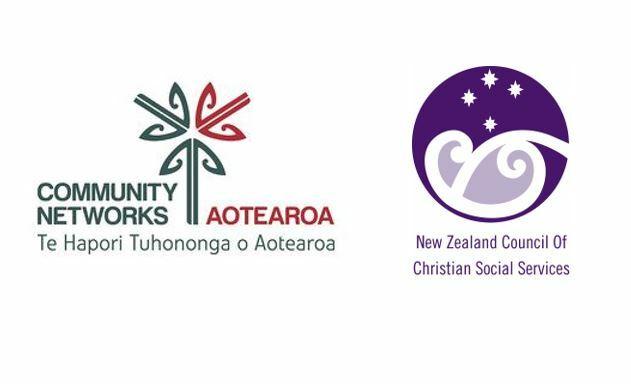 Policy Watch, the e-mail newsletter from the New Zealand Council of Christian Social Services (NZCCSS) endeavours to inform members on the latest policy developments, research, and events happening within the social services sector, and our faith communities. 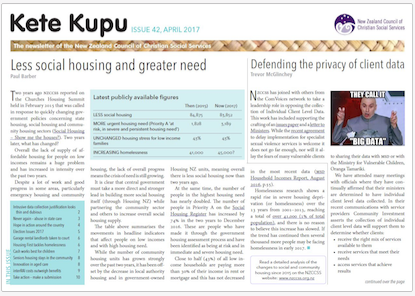 Visit https://nzccss.org.nz/ to find out more about the work of the Council and to access other publications – Kete Kupu, Vulnerability Report, Submissions, Reports.